On the morning of Sunday Mar. 31, 2019, word was released that the Canadian Women’s Hockey League (CWHL) would cease operating as of May 1. The news sent shock waves through the women’s hockey community, with players, coaches, and fans alike pondering not only how this could happen, but where would things go from here? The CWHL had provided elite, professional-level women’s hockey for 12 seasons. Numerous Olympians have helped to comprise the league within those dozen campaigns. What makes this news even more difficult to fathom is that the league’s Clarkson Cup championship was just held on Mar. 24, with the Calgary Inferno taking home the trophy for the second time in their history. An astounding 175,000 fans tuned in to watch that game between the Inferno and Les Canadiennes de Montréal. And now a week later, there will be no more league. There are a lot more questions than answers right now. And while this women’s hockey writer acknowledges that the news is still very raw for all of us who care about the women’s game and have for a long time, there are certain things that we all must consider in order to learn from this disappointment. The most difficult part right now has to be the uncertainty that the CWHL players themselves are feeling. The news of the league’s folding comes just four days before the 2019 IIHF Women’s World Championship gets underway in Espoo, Finland. While still maintaining a strong mindset in order to properly represent their country, there is no doubt that the CWHL’s big news weighs on a number of players taking part in the tournament. How could it not? For those CWHLers not competing in Finland, it may be even worse – especially for players who are more on the periphery. Just like their NWHL and NHL counterparts, the CWHL rosters have players who are so-called “fourth-liners” and/or players who are healthy scratches more often than not. This is normal in hockey. With now very limited jobs available at the professional level, these players face the very real conclusion that they may be without a team for the 2019-20 season. Where will they play next season? What is their best option? NWHL periphery players are contemplating the same questions in all likelihood because they are indeed impacted too. 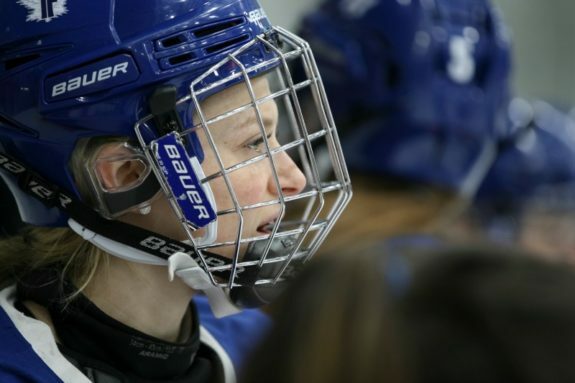 Renata Fast is a defender for the CWHL’s Toronto Furies and has represented Canada in both Olympic and World Championship competition (Photo Credit: Chris Tanouye/Canadian Women’s Hockey League). The most logical possibility for CWHL players to seek opportunity next season is the National Women’s Hockey League (NWHL). But with only five NWHL teams that have their own rosters that will quickly fill up, there is very little room for maneuvering in that regard. Sweden’s SDHL, Russia’s WHL (anglicized from (ЖХЛ), and Finland’s Naisten Liiga are options too, but obviously they would require major uprooting for predominantly North American players who are likely not in a position to do so. The uncertainty is very real and it truly tugs at the heart when you think about these players. Could the NWHL Assimilate Any of the Teams? The NWHL appeared just as caught off-guard by the CWHL’s announcement as was everyone else. Demonstrating their overall concern for the growth and well-being of women’s hockey, NWHL Commissioner Dani Rylan issued a statement of reassurance for the CWHL players and for the proponents of the women’s game. The 2018-19 CWHL season saw six teams competing in the league: Calgary, Montreal, the Toronto Furies, Markham Thunder, the Worcester Blades as their lone US-based team and the Shenzhen KRS Vanke Rays in China. Speaking from both positions of successful markets and prime geographic locations, it would not be far-fetched for the NWHL to assimilate at least some of the six CWHL teams. 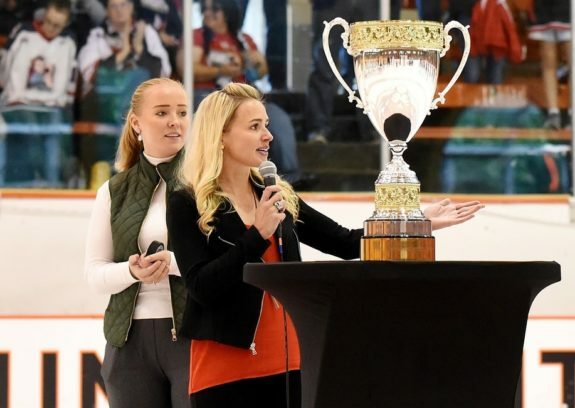 NWHL Commissioner Dani Rylan presents the inaugural Champions Cup at Princeton’s Hobey Baker Arena with SDHL Kommerisell chef Angelica Lindeberg in the background. (Photo Credit: Troy Parla). In a move that would be very reminiscent of the World Hockey Association (WHA) folding at the end of the 1978-79 season and the NHL acquiring four of their teams beginning in 1979-80, one would hope that the NWHL would be able to structure something similar. A few kinks would need to be ironed out though for this to happen. Unfortunately, it would be difficult to justify bringing aboard Worcester. The NWHL already has the Boston Pride and the Connecticut Whale to sufficiently cover the New England region. Likewise, from a financial and logistical standpoint, having a team based in China does not make much sense either. Saying all that, it completely makes sense for any North American professional women’s hockey league to have teams in Toronto, Montreal and Calgary. These are markets that would need to be tapped at one point or another regardless. Markham is tough though given it’s close proximity to both Toronto and Buffalo, but it is not out of the question to keep it sustainable in a league going forward. While the more imminent concern is the large amount of hockey players who are now in need of a team, we must also consider the implications that the CWHL’s fold could potentially have on the women’s game outside of the professional level – perhaps most especially on the concept of “Grow the Game” for future generations. A major focus of both the CWHL and NWHL has not only been to provide women’s players a league for after they have completed college/university, but to give young girls and young women a tangible dream of someday playing professional hockey just like young boys and young men are able to dream of. With one less league and six less teams, that window of opportunity is presently – and hopefully, temporarily – partially closed. This is critical to be mindful of right now, and is certainly not taken lightly by current and former players. 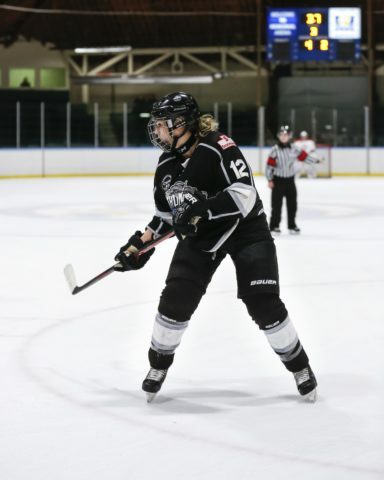 Retired forward Rebecca Vint played two seasons for the CWHL’s Markham (Brampton) Thunder and was a finalist for the league’s 2016 Rookie of the Year award. She finished her professional career in the NWHL with the Buffalo Beauts after the 2017-18 season. Vint went on to share her strong belief that something good will come out of the league’s folding, and that the same commitment and determination that women’s hockey players have repeatedly shown will ring through. We need to be realistic here too. For over a year now, there has been a crying out for and a calling for “OneLeague” – a single league comprising the best women’s players in the world instead of having the separate CWHL and NWHL. No matter what your stance on this concept might be and how the undertaking should or should not occur, a single North American league for the best players in the world has long been a must. While the majority of us never wanted to see a step towards the single-league concept come about in this way, we also have to recognize that our hand has now been pushed. Instead of two leagues, on May 1 there will only be one. 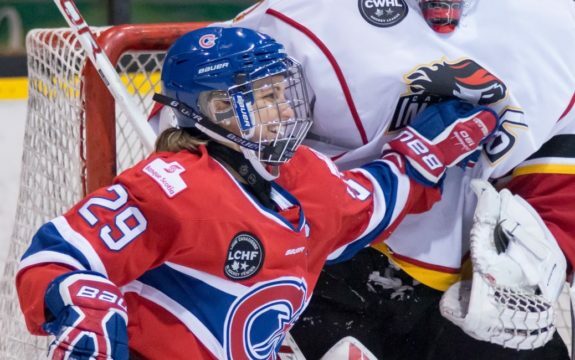 Marie-Philip Poulin of Les Canadiennes de Montréal led the CWHL in scoring during the 2018-19 season and was the league’s MVP (Photo credit: Céline Gélinas/CWHL). We have no choice but to accept this and move onward for the betterment of women’s hockey. What we can be rest assured of is that the love of the women’s game – especially among the players – is stronger than it has ever been. Within the past dozen years, women’s hockey players around the world have been knocked down time and again. They have forged onward and have made so many great strides within the past three or so years. This is a setback, but a temporary one. Winston Churchill once said, “Success is not final, failure is not fatal: it is the courage to continue that counts.” Churchill also stated, “If you’re going through hell, keep going.” These quotes seem to ring quite true right now. The players and other proponents of the women’s game will figure this out, and something very worthwhile shall spring forth. Never write-off or overlook determination. We can bet that many women’s players are upset, hurt and angry right now. Understandably so, times ten. But those are tremendously efficient fuels that can be poured upon a fire that has already been lit for quite some time. While I did not cover the CWHL regularly, I have had the opportunity to do one-on-one interviews for THW with many of the league’s current and former players including Jill Saulnier, Renata Fast, Marie-Philip Poulin, Rebecca Johnston, and co-founder Jennifer Botterill just to name a few. I have also previously worked with Noora Räty as a sponsor for her KRJ Skills camp for young hockey players. While I cannot say for sure where you will be playing next season, I wish all of the CWHL players my very best and hope that our paths cross again soon.